Hmmm...Although COM1 does show up under "hidden devices". I'll try uninstalling it and see what happens. Yep, uninstalling worked. It no longer shows up when I click on "Show hidden devices". Although there wasn't a problem with it. I believe it was just there from when it was enabled and the driver was still there. So because of that it showed up under "show hidden devices". Now that I uninstalled it and windows understands that it's disabled, it didn't try and reinstall it. Windows and in particular Windows 10 does seem to need a lot of "babysitting". That's why I like imaging software. Right now I'm using Macrium Reflect Home edition, which is great in my opinion. Much better than Acronis, which used to be great 10-12 years ago but is now a bloated mess. I take an image backup when everything is the way I want it and nothing is "broken" in windows. That way I can always go back. I'm still requesting a replacement board though. They finally approved an RMA for the board. Now I've just got to order some anti-static bags for the motherboard, ram, and pci express sound card. Also ordered a cpu socket protector from Ebay because they require that when shipping the mb back. Also ordering a plastic little case thing to store the cpu while I wait for the replacement motherboard. So this board is still having problems regardless, keeping the serial port disabled. Even though it's disabled in the cmos, today it showed up in device manager again. Even though I had fast boot disabled in the cmos which I thought "fixed" it. So anyway I went back just to double check the cmos and saw that it was disabled. Shut down the pc completely and went back to device manager and it was gone again. So it's clearly messed up. So I have never RMA'd a MB before as far as I can remember anyway...I believe since they approved my RMA, that once I ship it back, they will just look it over and make sure it doesn't have any physical damage and then ship me a replacement. Scott, in your experience is that how it works?. When I RMA'd a GIGABYTE board in the past they simply shipped back the same board (I marked it in a hidden spot to be sure). I had to go through the process again to get a new one. So in the end the problem was resolved but it took two tries. Scott. Well it did take them forever to finally agree to give me an RMA. It's not an expensive board so I don't see what the big deal is. So ok then I have the serial number written down, so that should be ok then right?. I'll just check to make sure the serial numbers don't match as soon as I get it back. Just don't want to install the board and build the pc again before I figure out it's the same board. Next time definitely it's gonna be an MSI board. I only have 3 system fan headers on my motherboard. I'm gonna be using a Noctua NF-A14 PWM 140mm Case Fan for the rear fan. 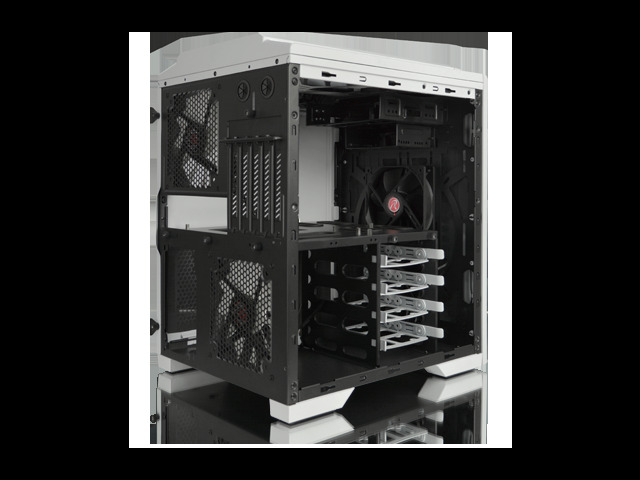 The case comes with two rear 140mm fans. The bottom one looks like it would draw air out over any mechanical HDD or anything in the internal 3.5 or 2.5 bays. Since nothing will be going in those bays it makes sense to only install a top one really. For the front I don't believe I'll really need a fan. However I do have a Noctua NF-F12 which I can use for the front top one. I can remove the bottom front one. That way the air intake from the front will blow over the motherboard and out the back 140mm fan. I've also got the cpu fan which will blow air out the back. ARCTIC COOLING Freezer 33 CO 120mm Dual Ball Dynamic Bearing Semi Passive Tower CPU Cooler will be my new cpu cooler. I won't be using the fans the come with it since they are only supposedly 2 pin fans. I'd rather take advantage of PWM. Last edited by FatGuy on Sat Feb 24, 2018 11:42 pm, edited 1 time in total. Think I might get two of the Noctua NF-A14 fans. Either way I can only connect up to 3 fans to motherboard PWM 4 pin connections which I'd rather take advantage of then use the 2 pin fans that these cases come with. So I'd remove the bottom 120mm in the front, remove the top 120mm in front and replace it with the Noctua NF-F12. I think that would work out well anyway. Of course the two 140mm would be in the back. Any comments on this Scott? If I wasn't going to fill the drive bays or slots I'd probably just use a single 140mm rear fan. I value a quiet system and too many fans are unnecessary and noisy. Scott. Makes sense Scott. I don't think I'll ever fill the drive bays with anything anyway. Thanks!. Scott, what do you think about SSD heatsinks?. Are these really necessary?. If the drives really had a problem with overheating wouldn't it be up to the manufacturer to fix these problems?. Have you an NVME ssd overheat? They are not necessary. Scott. Well Scott, you were correct about Gigabyte. They told me they couldn't find anything wrong with the board, which is total BS. Either they don't know what the hell they are doing or they don't want to honor their warranty, or both. I'm done with Gigabyte and done with that motherboard. If they do ship it back, it's going straight in the garbage. I'll order a new MSI board when I can. I did send them a "strongly worded" reply. We will see what they respond with...The thing is I had to log into a special account for RMAs to find this out. They didn't even email me to let me know. I will be purchasing MSI Z370M Mortar for the motherboard. Also will be purchasing Intel Core i5-8600K Coffee Lake 6-Core 3.6 GHz (4.3 GHz Turbo) LGA 1151 (300 Series) 95W BX80684I58600K Desktop Processor Intel UHD Graphics 630 to go in that motherbord. All the rest of my components including the new cooler should be compatible with this board. Finally got my motherboard back today. They agreed to give me a replacement board. However I have no idea if it is a replacement board. It was shipped back to me in the exact same box I shipped it to them in. The only differences were that they changed the anti-static bag and the serial number sticker has a different number on it. So they could have easily just put a new sticker on my old board. Otherwise there is no way for me to tell that the board is supposedly a replacement. They even used the same plastic cpu socket cover that I purchased just to ship the board. So they either took that cpu socket cover off the old board and put it on the supposedly brand new board or it's the exact same board I shipped them with a pretty new serial number sticker. By the way checkout Gigabyte reviews. Seems I'm not alone. I ordered that new motherboard from MSI that I linked. Just ordered it today. Don't know what I'll do with this Gigabyte motherboard. It's just not worth it to me to spend my time putting everything back together only to find out it's probably the same board. No more Gigabyte boards for me. Just have to save for a few weeks for that CPU. Then I will be all set. When exactly did Gigabyte go bad?. This old motherboard GA-P55M-UD4 that I'm using now never had any hint of any problems. Also built a pc for my mom many years back and she never had one problem with that. Now if you check out the reviews on Newegg or anywhere else for Gigabyte motherboards, they are all pretty bad. Especially if you look at the amount of people that need to RMA their products and the RMA service, customer and technical support are the worst I've experienced. Plus, if look into this you will see it's not just me. Gigabyte get's an "F" from the BBB. "Factors that affect the rating for Gigabyte Technologies include: Failure to respond to 51 complaints filed against business."